MoldHold™ is a specially designed, patent pending product that quickly and effectively contains mold where it grows with minimal disturbance! MoldHold™ is a first response, rapid response “sticky tape” that adheres to wet surfaces and prevents spores from becoming airborne. 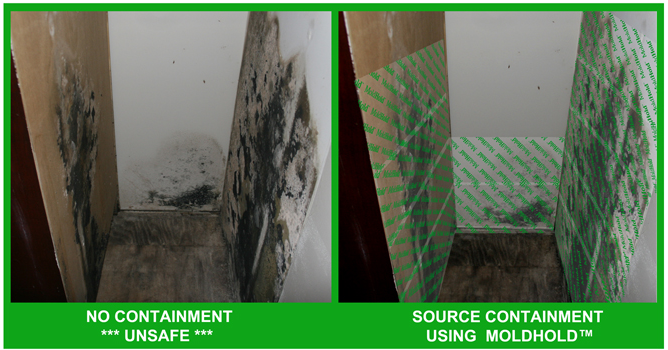 Quickly encapsulating mold can pay big dividends health-wise and financially. The faster you contain mold, the less it costs you. When you delay, you really pay! 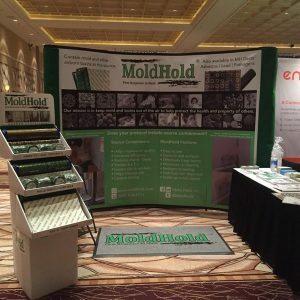 Some products have been rigged to work – tape and plastic; tape and shrink wrap; and even poly carpet protectors – yet none of them will stick to a wet surface and will trap mold. They only create a pocket of spores that are much more likely to be breached while remediating. Too, they require at least two people to apply them. 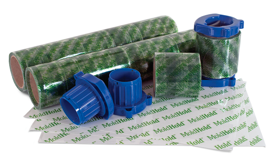 MoldHold’s™ glues and heavy barriers make it impossible for mold to breakout and can be applied with just one person.